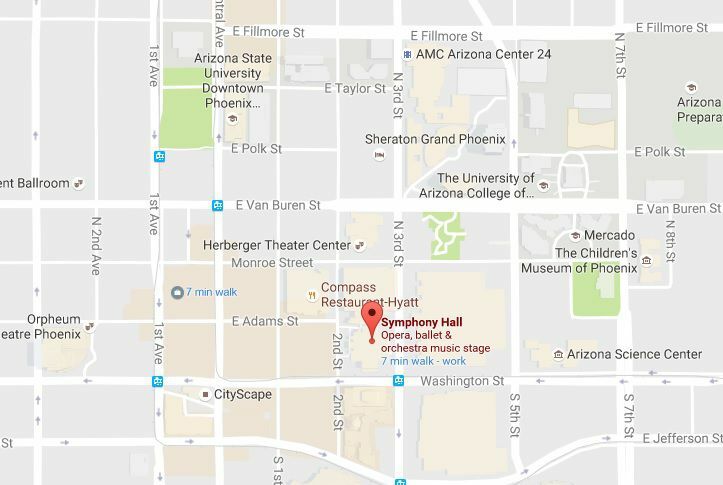 Symphony Hall is home to the Phoenix Symphony Orchestra, as well as other performing arts groups such as Arizona Opera and Ballet Arizona. The Phoenix Convention Center is located within blocks of the Talking Stick Resort Arena and Chase Field, and across the street from the Phoenix Convention Center and the Herberger Theatre in downtown Phoenix, Arizona. The major cross streets are Washington and 2nd Street. Remember — Washington is a one-way street going west. The entrance to Symphony Hall is on the west side of the building, just north of Washington on 2nd Street. From North Phoenix/Scottsdale: Take the Piestewa Peak Parkway (SR 51) south to I-10. Exit I-10 at Washington/Jefferson Street. Turn right (west) on Washington Street to 2nd Street. From East Valley: Take I-60 west to Interstate 10 west. Exit I-10 at Washington. Take a left (west) on Washington to 2nd Street. From West/Southwest Phoenix: Take I-10 east to 7th Street exit. Turn right (south) on 7th Street to Washington. From Northwest Phoenix/Glendale: Take I-17 south to Jefferson Street. Turn left (east) on Jefferson Street to 2nd Street. By Valley Metro Rail: Use the 3rd Street/Washington or 3rd Street/Jefferson station. This is a split station, so which station depends on which direction you are going. Here is a map of Valley Metro light rail stations. See driving times and distances from various Greater Phoenix cities and towns to Phoenix. To see the image of the map above larger, simply temporarily increase the font size on your screen. If you are using a PC, the keystroke to us is the Ctrl + (the Ctrl key and the plus sign). On a MAC, it's Command+. You can see this location marked on a Google map. From there you can zoom in and out, get driving directions if you need more specifics than mentioned above, and see what else is nearby.